When you are out in the wilderness having the ability to start a fire is essential. There are several different methods one can use to accomplish this; the easiest way is to carry a Ferro rod. A Ferro rod is a lightweight metal rod and when struck will provide a spark to get a tinder bundle ignited to start a fire. It is an excellent alternative to carrying matches or a lighter. I recently had a chance to review and field test the Grab Life Outdoors (GLO) Ferro Rod. The Grab Life Outdoors (GLO) Ferro Rod is a well made striking rod. It is solidly built and feels good in your hands. The hardwood handle is smooth and easy to grip. The attached multi-tool and striker is made of quality metal and has good weight for striking the Ferro rod. It comes attached to a decent length of paracord. Overall I was impressed with its solid construction. I took a hike out to one of my local trails to test out the fire starting capabilities of the Grab Life Outdoors (GLO) Ferro Rod. This Ferro rod is lightweight and takes up very little room in your backpack. It also can be worn around the neck for easy access. The Grab Life Outdoors (GLO) Ferro Rod comes with an attached 6 function multi-tool striker. 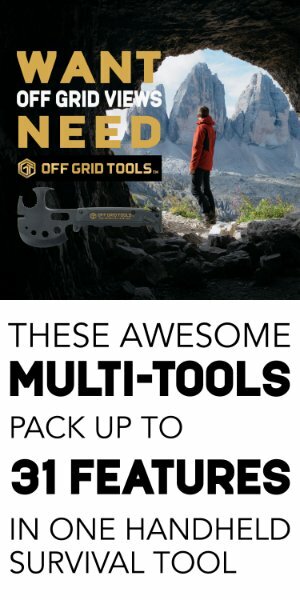 The multi-tool is a tinder scraper, bottle opener, hex wrench, map scale and ruler. I tried using the curved tinder scraper to produce some fine shavings for my tinder bundle. It did not work that well. You’re better off using a knife. It is much more efficient. The first step to get a fire going is to make a tinder bundle. You can create a tinder bundle from a wide range of dry tinder. Just find some dry tree bark, grass or leaves and make it into a nest. Then line it with fluffy plant material like flowers that have gone to seed. Dried Milkweed, Thistle, Cattail or finely shaved wood works great for lining your tinder bundle. You could also use dryer lint, twine, cotton balls or steel wool. It only took a few strikes to get the tinder bundle lit. The Grab Life Outdoors (GLO) Ferro Rod produces an ample amount of sparks to get any tinder bundle ignited. I was very impressed with the spray of sparks that came out on each strike. I have used other Ferro rods in the past that are too small and give off very few sparks. The attached metal striker allows for easy and efficient striking. The paracord is the perfect length and gives you enough span to get solid strikes on the Ferro rod. The Grab Life Outdoors (GLO) Ferro Rod is a quality built Ferro rod. The sparks it produces enables it to be used in many conditions. Overall I was pleased with its performance. Don’t skimp out on your next Ferro rod. It’s worth buying a well built striking rod like this one made by the team at Grab Life Outdoors. Disclaimer: I was provided this product for an honest review.